• Sensitive and accurate. Use as little as 20 μL samples. Linear detection range in 96-well plate for 20 minute incubation at 25°C: 0.02 to 10 U/L glucose oxidase for colorimetric assays and 0.002 to 1.5 U/L for fluorimetric assays. Glucose oxidase catalyzes the oxidation of glucose from D-glucose to D-glucono-δ-lactone. Physiologically, it aids in the breakdown of glucose into smaller metabolites. It is widely used in electrochemical glucose sensors designed for diabetes patients. Simple, direct and high-throughput assays for measuring glucose oxidase activity find wide applications in research and drug discovery. BioAssay Systems’ glucose oxidase assay kit uses a single Working Reagent that combines the glucose oxidase reaction and color reaction in one step. 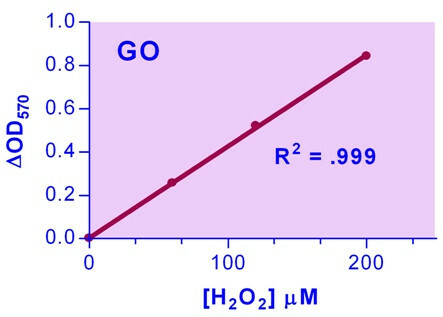 The change in color intensity of the reaction product at 570 nm or fluorescence intensity at λex/em = 530/585 nm is directly proportional to glucose oxidase activity in the sample. Applications For quantitative determination of glucose oxidase activity and evaluation of drug effects on its metabolism. Detection Limit 0.02 (OD), 0.002U/L (FL).